Home › Zimfest News Blog › Posts Tagged "donations"
Wrap up your holiday shopping at smile.amazon.com/ch/91-1951506 and AmazonSmile donates to Zimfest Association. Our long term goal is to have the majority of Zimfest participants be members of the organization. We have seen an increase in previous years. It is our hope that a healthy dialogue about the festival and Association can emerge from a membership that feels a sense of ownership in the Zimfest Association. Membership covers the calendar year January 1st through December 31st. Membership dues are an essential part of keeping Zimfest alive and vibrant. From as little as $10.00 per year for our Youth/Student membership, there are membership categories to fit any budget and situation! Consider Regular, Family, Couple, Teacher, Lifetime, and Lifetime Family memberships. It’s also easy to add a donation to your membership payment. Members may choose to have their names published on the website and in the Festival Guide as a public display of support for Zimfest. Membership fees are 100% tax deductible, for now at least! Please refer to the membership page to renew or initiate a membership. Please write us at gro.t1556024915sefmi1556024915z@sre1556024915bmem-1556024915az1556024915 if you want to clarify your membership status. Join or renew now for 2019. Thank you for participating in the $1,000 matching challenge, from friends and relatives who really know nothing about Zimfest to our long-time loyal supporters. With all of your help we raised $1,500. A big thank you to our anonymous donors for this final Zimfest 2018 challenge. 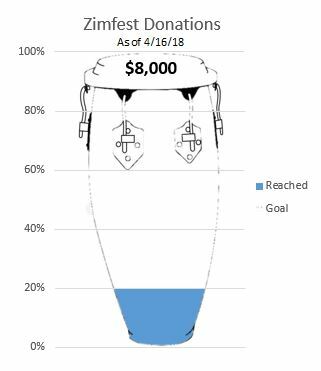 We have met and exceeded our $8,000 fundraising campaign goal for Zimfest 2018. Much appreciated, from the Zimfest Board! Just $10 from 21 people to almost reach the $211 to raise to reach $1,000. It costs $160 to house one Zimbabwean at Zimfest for the weekend. There are 3 more days in this $1000 matching challenge for Zimfest. No donation is too small. 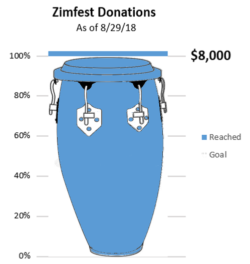 To donate, go to https://zimfest.org/about/support-zimfest/. Zimfest was amazing! We have a $1000 matching challenge coming out of Zimfest from Aug. 12 to 26 (extended). Thanks to some anonymous donors who want to continue to help with the fundraising efforts. We have raised $25 of $1000. No donation is too small. SEVEN DAYS until Zimfest! We are at 71% of our $8,000 goal. Just over $2,300 remaining to bring in. Thank you to those who have contributed so far. 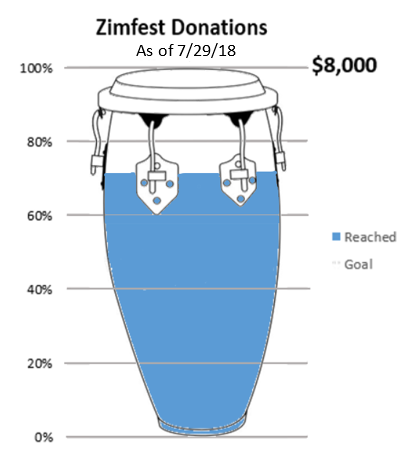 If you have not sent in a gift, please consider donating to help towards the cost of transportation, room and board for the group of talented Zimbabwean teachers; implementing the new festival registration system; and purchasing marimbas to augment the supply of instruments at the festival. Any amount is appreciated. We have another member of the community who has generously pledged to match the next $500 the community raises from July 3rd-10th. 16 of you came through for our successful previous matching challenge. Sharing the message can also help make an impact. Please help us maximize this match towards our goal by making a donation to Zimfest. No donation is too small!! Here are some ways that your donations help. Zimbabwean Independence Day is April 18th and Zimfest 2018 is only four months away. Help us keep Zimfest and the celebration of Zimbabwean culture strong and active into the future. Our fundraising goal for this year is $8,000, and we’ve already raised $1,600! The remaining $6,400 could easily be met if each of our 400 participants contributed $16. See the various ways you can donate by visiting https://zimfest.org/about/support-zimfest/. We hope you are doing well and have found this year challenging as well as thought-provoking, given the many newsworthy events both in Zimbabwe and the USA! We write to announce the Zimfest Association’s Annual Campaign and Membership Drive. This will be our fifth year running the campaign, and we are hoping that it will be our most successful ever. While the festival itself provides some income to the association, these funds are simply insufficient to help sustain and grow the Association and the Festival. Here are some ways that you can help. Our goal is to have all Zimfest participants be members of the organization. It is our hope that a healthy dialogue about the festival and Association can emerge from a membership that feels a sense of ownership in the Zimfest Association. Membership covers the calendar year January 1st through December 31st. Membership dues are an essential part of keeping Zimfest alive and vibrant. From as little as $10.00 per year for our Youth/Student membership, there are membership categories to fit any budget and situation! Consider Regular, Family, Couple, Teacher, Lifetime, and Lifetime Family, memberships. Members may choose to have their names published on the website and in the Festival Guide as a public display of support for Zimfest. Membership fees are also 100% tax deductible, for now at least! Please refer to the membership page to renew or initiate a membership. If you renewed or took out a membership early in the year and did not hear from us, it may have been due to a glitch on our website signup form. Please write us at gro.t1556024915sefmi1556024915z@sre1556024915bmem-1556024915az1556024915 if you want to clarify your membership status. While Membership dues are a great start, Zimfest needs a wider base of support to ensure long-term stability. For this reason, we are asking for everyone who can to make a tax-deductible donation to the Zimfest Association. 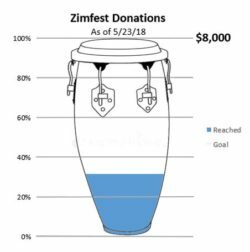 These donations have been essential for the festival in the past, and your support of Zimfest now will help secure the future of the festival and sustain our financial well-being. If your company supports matching donations or in-kind work, find out from your supervisor or Human Resources department how your company can match your contribution—often dollar for dollar! If you are a regular attendee of the festival, this is the perfect year to donate. Without a festival this year, we hope that you consider donating even a small fraction of what would normally go towards travel expenses, workshops, meal cards, etc. to help keep the momentum in this gap year. 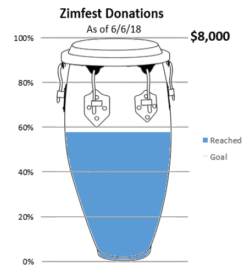 Your contributions really do make a difference and help the Association continue its efforts to put on the best Zimbabwean music festival in North America! To donate, go to the Support Zimfest page. Finally, we’d like to remind you of three completely painless ways you can donate and help Zimfest on an ongoing basis. Go to the Support Zimfest page for information on Giving Assistant, AmazonSmile and eBay Giving. If you’d like to learn more about this festival and what goes on during the other 360 days a year, please contact us at gro.t1556024915sefmi1556024915z@dra1556024915ob1556024915 or review our recent activities on our blog . Thanks for all you do to help make Zimfest a success. Best wishes for the holidays and new year, and we hope to see you at Zimfest 2018!